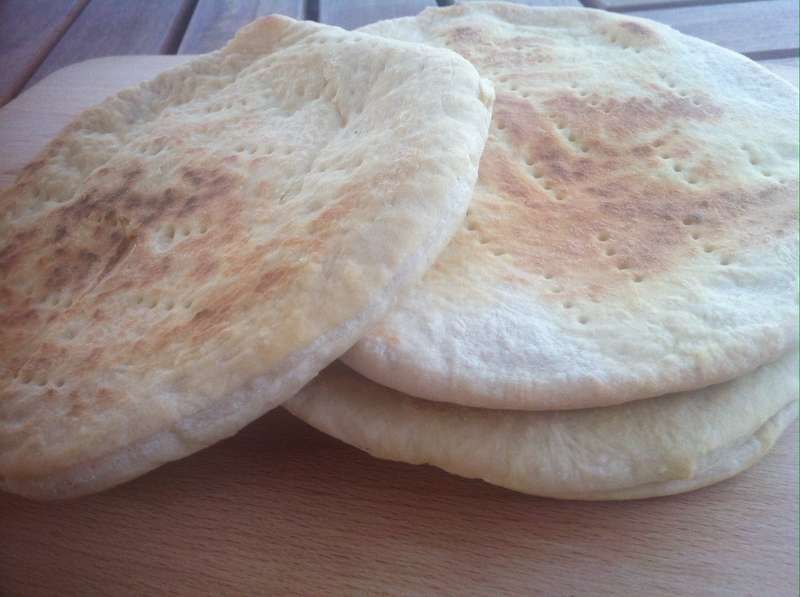 Our very best homemade Greek pita bread recipe! And the best part, ready to bake in only 10 minutes. Add flour into mixer bowl. Add the yeast, sugar and salt and blend with a spoon. Add a little bit of water and start mixing, using the dough hook. Pour in the water a little bit at a time, at a steady stream, whilst mixing. Wait each time for the water to be absorbed and continue adding some more. Depending on the flour, the dough may or may need a little bit less water than this pita bread recipe calls for. After mixing for a while, the dough for your pita bread should become an elastic ball. If the dough is still crumbled, you should add some more water. If it becomes too sticky, this means that you added more water than needed. In that case, add 1 tsp of flour and continue mixing. When done, cover the dough with a kitchen towel and let it sit in a warm place, for at least 20 minutes, until it doubles its size. This is an important step for this pita bread recipe, so that the pita bread becomes fluffy and soft. If it is winter, turn the oven on for a few minutes, until it’s a little warm, switch it off and then let the dough rise in it for a few minutes. Take the dough out of the bowl and knead a little bit with your hands. Split in 6-7 evenly sized portions. To form the pita bread, you can either use a rolling pin, or stretch it with your hands, about 1/4" thick. For a more traditional look on your oita bread, use a fork to make some holes on top. Heat a non-sticking frying pan to medium-high heat (with no grease) and fry each pita bread for about 3-4 minutes on each side, until slightly browned and still soft. To give more colour, push the pita bread with a wooden spoon on the pan. If not consumed right away, wrap the pita bread with an elastic wrap, in order to remain soft. Enjoy!